and a server application providing an exclusive feature. The server acts as a proxy sitting between a user and a client. new connections to the client. Then the client forwards the connection up to the local resource. multiple connections to each of them. users to activate forwards individually and enable some access restrictions. Internet with a high bandwidth or local with some port forwarding. the server and submit a list of available forwards (resources you can access by passing trough it). resources, and (2') activate one of them. 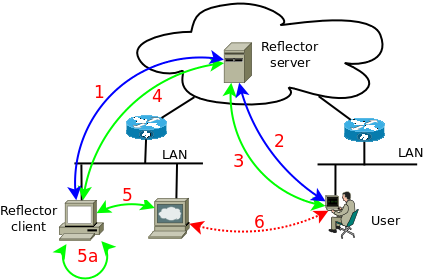 The server starts a forwarder listening for connections. (6) virtual connection going through the server and the client. client itself or even somewhere on the Internet ! TCPR application and library are released under the term of the GNU GPL. the access to forwarder can be restricted to some IP and for a limited period. kind of feature is already widely used by virused zombie computer ! or control this kind of usage ! run as an application. Depending on your OS and your need, you have different way to start it. the same application and started the same way, using a dedicated option. Client and server require a .ini containing the configuration. Python 2.6 can run .zip and .egg file directly, TCPR is build this way. Python 2.5 can run installed package as an application using option -m, TCPR can be run this way too. the python build-in install process. usage: tcpr -s [ config_file ] # start in server mode"
These files can be freely downloaded here. TcpProxyReflector-X.X.X.tar.gz : this is the source file. (installable with python setup.py installem>). TcpProxyReflector-X.X.X.egg : this file can be run without install by Python 2.6 and above. TcpProxyReflector-X.X.X-win32.zip : this one contains a Windows .exe file and some doc. Fore more on how to use them, look at the Installation section. For testing purpose, you can run server, client and console on the same host. connect to the reflector port ( default is 2311 ). restricted to the manager user. The server require a .ini file with a [server] section. and modify it to meet your need. The file is self documented. The client need a .ini file with a [client] section. type help for help. Dynamic ports (52000-52899) fixed ports (52900-52999). Command help will list all available commands and give samples. Make a list of connected clients and available forwards. Then follow 3 forwards, resources made available by the client. start forward 0 to activate rdp. favorite RDP client and login on your windows station. ...to restrict access to one IP and for 30min only, and allocate the port from the fixed range. * allows anybody to connect to the forwarder and t=0 remove any time limit. denying new one, or terminate it to close open tunnels. Authentication can be enable to authenticate users and clients. Connections to active forwarder cannot be authenticated by TCPR. On your server, uncomment the line user_db in the [server] section. Replace passwd by the path of your password file. If needed, the option -m can be used to change this password like this. accounts, and put them in groups. Only user manager can manage accounts. multiple client and a user can login multiple time, from multiple hosts. Now you must add credential to the .ini file of your client. Don't forget to restart the server ! and all available forwards in blue when stopped or green when started. field empty to let the system allocate one from the dynamic range. type a time followed by one letter s, m, h, or d for seconds, minutes, hours or days. 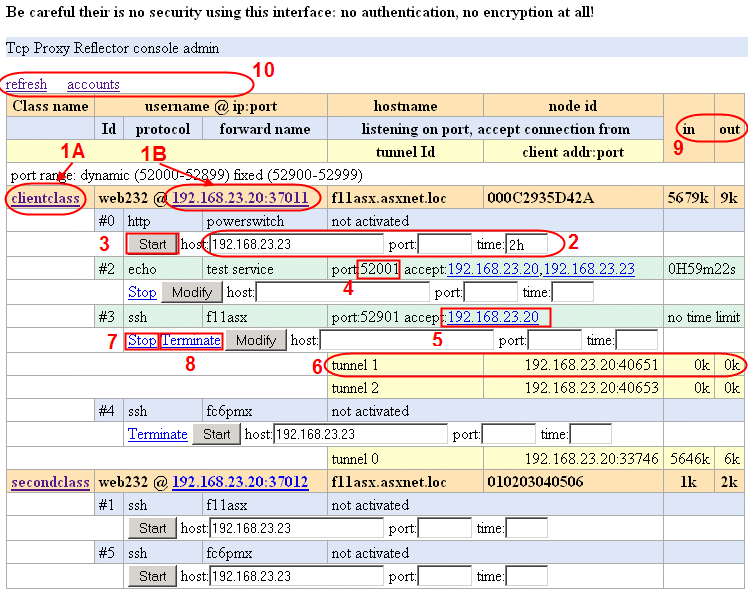 remove host IP by clicking (5) on the address. When a user connect to the forwarder, a tunnel is open, in (6) yellow. or (8) Terminate it and close all open tunnels. On the right side, you can see the (9) traffics in Kbytes. If keep alive is enable, the counters will slowly increase with time. display a list of all the accounts: users, clients and groups. you must use the console interface. Today TCPR has no service extensions for Windows. that will restart the program if ever it crash. Run the command manually to start TCPR. the program will ignore the logging configuration and display log to the console. [handler_rotatingfile] to meet your need. more flexible, it cannot do things dynamically. Anyway both are unique tools in the network landscape. pre-assign ports for each clients. forwarded port that are always active and world reachable. Here are some kind of situation where TCPR could be useful. server and connect to it to access the workstation remotely. You are a web developer and you are in a meeting with one customer. and only on your laptop ! You have one minute to give him an access ! send the URL to your raring customer ! You are remotely connected to a Windows box running SQLServer. don't want to install or cannot install them on the remote server. On the remote server download TCPR and start it to forward port 1433. Start your applications open the DB via the server forwarder. and only on your laptop ! For reminder here is the .ini file you have setup long time ago. Test the URL in your browser and send the link to your customer. I tried to reproduce this easiness for my own appliance ! decided to write a user friendly application around it. If you still don't understand what it is ! to every other hosts on the LAN or even Internet. For short, this work by having a server on the Internet running the TCPR server. or the unsecured web interface and activate some of the available resources. target. Use the appropriate network client application to connect to this port.